With the rise of technology and gamification trends in the modern consumer world, outdoor advertising is rapidly evolving from mere paper posters and billboards to multisensory pieces that are engaging, educational, entertaining and sustainable. This article offers a brief recap of some game-changing examples of how to harness the power of traditional on-the-wall ads by giving them a little tech and/or designer tweak. Below, there’s a list of wall and outdoor advertising, split into categories, depending on the approach applied. Fundação Pró-Sangue has launched a wonderful campaign around Sao Paulo city with the “Blood Charger Posters.” The effort raises awareness of blood donations though simple posters that allow people to charge their smartphones on the go. The ad features a stretched arm, from which a red thin wire comes mimicking the medical tube system. The ad reads “You can count on us when you need us. Can we count on you? Donate,” encouraging people to go donate blood after they used the “blood” of every day, the cellphone charging power. Relief organization Misereor collaborated with Hamburg-based agency Kolle Rebbe for a series of interactive donation posters that illustrate how donated money can help people in need. The Social Swipe interactive shields visualized the big difference a small donation of 2 euros can make—once a person swiped a credit card along a dedicated slot in the middle of the piece, he or she could see what the donation did. The card “cut” a piece of bread for a hungry man or “cut” the rope on the hands to set a child free. As part of its “Beck’s Records” project, Beck’s NZ unleashed a poster positioned as “the world’s first playable poster.” It allowed passers-by to play and remix various tracks, created just for the occasion. Using special conductive ink, the posters played a range of sounds when the ad’s surface was touched. Similar technology was used in the Schwartz sonic poster featuring “touch sensitive” inks that allowed to “hear the voice” of 16 different spices and herbs. Their voices were imbedded into a unique sound mosaic. The music was played not directly, like it was in the first piece, but thought an app on the smartphone of the person who touched the poster. IKEA unleashed an unconventional billboard that played around the space-saving theme. The piece used the RGB lighting approach—depending on the color of the bulb that lighted up the billboard (red, green or blue), three different messages could be seen. Using just 3 lines, 3 colours and 3 bulbs, IKEA managed to turn the 9 m² ad space into 27 m². With kids protection in mind, in 2013 the Aid to Children and Adolescents at Risk Foundation (ANAR) in Spain revealed a street advert that delivered different messages to kids and accompanying adults (possibly, their abusers) at a time. While tall adults could see the general message “sometimes, child abuse is only visible to the child suffering it,” short kids could read “if somebody hurts you, phone us and we’ll help you” plus a phone number. The secret of the ad was in the lenticular top layer that revealed different elements at different layers. Some posters do not just inform or call to action, they also provide people with a physical piece of help. For instance, Canadian tattoo removal company “Fading Fast” released its street ads across Toronto—the ads featured heavily tattooed people. But these tattoos were actually just sticker vouchers for the removal of the ink patterns on the skin. Passers-by could come closer and peel the stickers off, getting a 50% off their future tattoo removal. The “Payback Collective” interactive posters by Brazilian agency Mark + allowed not only pick something valuable, but also to share it on the go. The initiative was developed specially for people who want to leave extra coins and those who do not have change to pay for their bus fares. The yellow stripe posters let pedestrians slot their loose change into special pockets in the bus-stop or right on the bus, and take some coins if they don’t have enough money to pay for their bus tickets. There’ve been many ways to turn old posters into something really worthy—from transforming billboards into jeans and even artists residence. The latest examples of turning old on-the-wall posters that transform into DIY lampshades. The project was developed by Austrian design collective Mostlikely that merged origami art and love to design experiments. 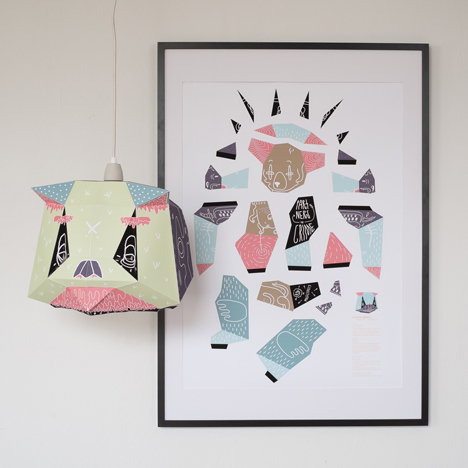 The artistic posters can be hung on the wall or cut out and glued together, forming a lovely animal-inspired lampshade. In fact, this approach can be leveraged by bigger brands who would want to allow its biggest fans to get and re-imagine its on-the-wall ads into something really handy. Posted in Advertising, Features and tagged Beck’s, engagement, IKEA, outdoor advertising, Schwartz, sustainability, technology. Bookmark the permalink.